Growing up near the Pacific Ocean in the Sydney suburb of Mosman, Forbes Carlile, like most Australians, had an early need to learn to swim. Forbes recalls that, at first, he was an unwilling student in his lessons at the nearby Balmoral rock pool, but swimming soon became his boyhood hobby and sport of choice. This initial connection with the water foreshadowed what would become a lifetime of achievement. Excelling in a number of sports, and in particular swimming, drew Forbes to study human physiology at University. Professor Frank Cotton, considered the father of Sports Science in Australia, showed an interest in Forbes and guided him through his academic career as a student and eventually teaching fellow and University lecturer. The study of Sports Science mixed well with coaching swimmers where Forbes found success, evidenced by his appointment as Australian Olympic Coach at the 1948 London Games. Under Professor Cotton’s mentorship a solid foundation in research and visionary thinking was fostered, which became a fundamental part of the Forbes Carlile the world was coming to know. When Professor Cotton passed away in 1955, Forbes lost a big influence in his life and found himself at a crossroads. Leaving the University community behind, he made the decision to start professional coaching, which launched him into a full time occupation that would become the greatest passion of Forbes’ life. The course of world swimming was changed forever. 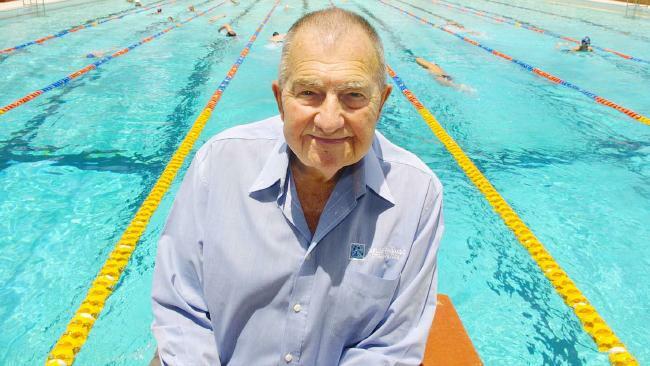 Forbes made an ambitious start into his new career of coaching by establishing Australia’s first commercial swimming school which catered for all levels, at the Drummoyne pool. This started the Carlile tradition of catering for everyone, from the most timid beginner to the most promising Olympic athlete. There were tough times in these early days, especially with the unpredictability of a pool which had to be emptied and filled overnight, every weekend, with sea water from the harbour. On more than one occasion, swimmers arrived for training only to find a sign stating, “Saturday Races Cancelled – Dead Dog in Pump”. One benefit of having the swim school was the opportunity for university students to study the swim program as part of their degree requirement. One of those students was Ursula Allen. That chance encounter initiated a lifelong partnership, both on and off the pool deck, and began the coaching partnership of Forbes and Ursula Carlile. Through building the school and seeing first hand the positive impact swimming had on his student’s lives, Forbes was inspired to coin the phrase “To swim well is an asset for life”, a saying which has become commonly used in the swimming community and synonymous with Carlile Swimming. Even at it’s most successful, coaching in Australia was a seasonal activity and alternate means of income were required. During the winter months, overseas coaching and some pioneering efforts in underwater film making paid the bills and provided valuable experience. In the meantime, he and Ursula continued their research into training methods, conducting experiments with warm-ups, tapering and the shaving down of swimmers. The pace clock, a training tool considered commonplace today, was an innovation of the Carliles and gave Forbes a symbolic presence on virtually every pool deck around the world. In 1961, the Carliles relocated to the newly built Ryde Swimming Centre. While the outdoor facility was a big improvement on their previous “drain and fill” pool, Forbes and Ursula tell tales of chasing, “bribery”, and coercion to get swimmers into the unheated, often very cold water. A brainwave came to install an indoor pool in the backyard of the house they were renting near the Ryde pool. So, while the landlord was on holiday, the Carliles built a 12.5 metre indoor teaching pool extension to the garage – much to the landlord’s dismay! This little indoor pool was the start of a year-round teaching revolution in which the Carlile’s teaching systems flourished. Although competitive coaching remained the primary passion for Forbes and Ursula, the learn to swim side of their business continued to grow. In 1968, with encouragement from German physical education researcher Lisolett Diem, baby swimming was given new emphasis and, eventually, became regarded by the community as an important part of a holistic swimming program. The best example of what the Carlile approach had to offer was captured in a 1969 photograph of a little girl named Jenny, proudly posing with her tadpole (now Superfish) certificate in hand. This young woman was the same Jenny Turrall who won the 800 metres World Championship just four years after taking that photograph. The more than half a century of Carlile Swimming history is full of dramatic achievement. Few can forget the unbelievable performance of Olympic triple gold medallist Shane Gould, who held the world record in all freestyle distances from 100 metres to 1500 metres simultaneously – a feat most believe will never be repeated. In addition to all the Olympic medals and world records, there were and still are countless other victories occurring daily in the Carlile pools as children gain the skills to make them happier, healthier, and safer. Warm water, small, graded classes, and well trained staff providing a consistently high quality program, form a winning combination that continues to be the benchmark of excellence to this day. That small pool behind the Carliles’ home is still there. The great grandchildren of the original Carlile students are welcomed and children still pose for pictures with their certificates. The legacy of the Forbes and Ursula Carlile Swimming Organisation has become Carlile Swimming and is rewarding many thousands of children every day. This aim is alive and well. By building on this exceptional platform, the Carlile Swimming Team provides swimmers and their families the opportunity to embrace a club which is setting the standard for innovation and personal development.